Welcome to LuciE Desmarais L.Ac. 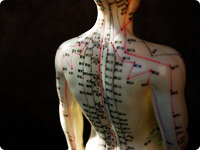 Acupuncture is the ancient Chinese method of healing. Herbal therapies may be combined with acupuncture treatment. By combining Western knowledge and techniques, acupuncture has become an acceptable and sought after treatment for many disorders including neck and back pain. When practiced properly, acupuncture is safe. The U.S. Food and Drug Administration requires qualified practitioners to use sterile nontoxic needles. Myth: Acupuncture is dangerous and also painful. There is no pain. The individual may feel a tiny prick upon insertion of the needle. Sometimes the individual does not feel the needle at all. In some very rare instances there can be a little bruising at the point of insertion. There is no tissue damage as a result of insertion generally as the needles used in acupuncture are very hair like and they have a rounded point and are solid. Unlike in the hypodermic needle the acupuncture needle does not have a cutting edge. There is no actual danger as doctors use single use disposable needles.